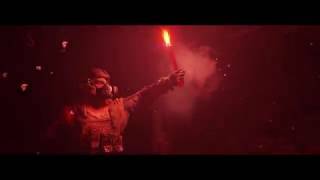 Ukrainian developer 4A Games made their debut in 2010 with the underappreciated Metro 2033, a new IP based on a book series that featured excellent atmosphere, a unique setting, satisfying action and worthwhile story. There were some issues with stealth, and the game's performance wasn't entirely well optimized, but it gained a dedicated fan following. A few years later, the sequel Metro: Last Light addressed most of these issues, and helped the team grow even further. As first announced last year, the team will be back in 2019 with their next entry, Metro Exodus. At E3 2018, we had a chance to go hands-on with a demo level from the game. It's been two years after the events of Metro: Last Light. 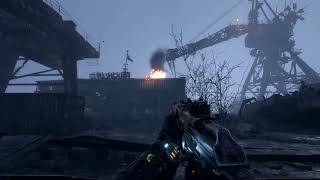 In the game world, which depicts a post-nuclear war apocalypse, the protagonist Artyom sets off on a journey across the country, trying to reach Mount Yamantau. This is because the people living in the subway tunnels underneath Moscow have learned that the country's High Command has potentially survived, and are hiding out there. It is presumed Artyom wants to reach his nation's remaining leaders in hopes of restoring order in the country. To get there, he uses a restored Soviet locomotive train named Aurora, alongside a group of like minded Spartan Rangers. In this new world of nuclear winter, the developers promise overhauled weapon customization, new survival and crafting mechanics, dynamic weather, day/night cycle, and a narrative penned with the help of the author of the original books Dmitry Glukhovsky. There is said to be more dialog than the first two games combined, and a game that’s almost twice as long as well. Player choice will once again matter, and being stealthy and non-lethal, versus going in guns blazing, will have appropriate consequences. The developers said the level we get to check out is set during the Spring on the Volga river, and will feature up to four hours of content in the full game, for those wanting to scour its every nook and cranny. Before jumping into the demo, we had a quick glance at the controls. On the controller's face buttons and D-pad, there's quick access to throwing knife, grenade, molotovs, a distraction device, binoculars, lighter, night vision, and backpack. We didn't get a chance to try out all of these elements, but they are likely to play a key role in the full game. Our level began with the train rolling through a snowy Russian field, similar to what has been showcased in the game's E3 2018 trailer. Finally into the demo, we observed a cutscene as our locomotive was forced to an abrupt stop. Train captain Miller declares that there is a camp and roadblock on the tracks, and so we are stuck for now. It's not known if the block is intentional or just for the safety of locals, so Artyom and Anna are requested to go out and investigate. After grabbing a few crafting materials and our backpack, we head out and turn left off the tracks and into a semi-flooded area. Here we investigate a few run down structures, for more materials. Anna finds her desired sniping position to survey the area, and climbs a tower. Meanwhile, we see a church across the water, and its bell begins to ring. The pair agrees its best to investigate. Artyom grabs a nearby boat and rows over. On the way, we stop by one of the small islands and grab some more materials. There is only one way into the church – via a water passage. We have little choice but to row in, as a crazed leader of the church speaks of heretics to the small gathering of worshippers. Our boat gets trapped, but we are able to exit and make our way to the top of the church tower. Up in the tower, we find a woman and her daughter – they are being held against their will. But with men on your tail, there is no time to help them, and Artyom climbs out the window. From here, we must escape the church, and we try to do this as stealthily as possible. We dispose of a few enemies that are hunting us via silent takedowns. Sneaking through the church, the area is very small and rather claustrophobic, and a wrong turn can put you face to face with an enemy. You still have a wrist watch, which displays how visible you are, and it's possible to blow out candles as you go. We sneak into what turns out to be a tiny room with a blind fortune-telling woman. She believes you're one of the church goers and some odd and amusing dialog follows. Leaving the room, we continue along the catwalks, trying to find a way out. Eventually though, we get spotted. It's time for a shootout, as enemies begin to close in. Notably, they are communicating, and not just in generic terms like “he is over there," but actually mentioning specific locations, such as "shed behind church" where we were indeed taking a breather. That attention to detail is fairly impressive. Equally impressive is the fact that after we mowed down a few of the foes, the rest actually surrendered, admitting they are in the presence of a superior warrior. The gunfire itself, while it lasted, was fairly satisfying and felt similar to the previous entries. With the church situation resolved, we get back on the boat and begin to make our way back to the other shore. However, on the way we are attacked by a few smaller mutated creatures – we are able to shoot them off. Moments later, a huge fish appears, and grabs our entire boat with its big mouth. Artyom ends up in the water, but is thankfully pulled out by a lookout. Safe on land, we explore a nearby crashed airplane, where more materials are found, as well as a cassette tape which provides some backstory. As we’ve got a few materials over the journey, we took a moment to pull out the backpack, which acts as your on-the-go crafting tool. We were able to craft a couple of health kits, and customize our rifle with sights, barrels, stock, and other components. We make our way back to the train, where we find that the woman from the church and her daughter have made it there safely. Anna is back as well, and tells us to speak to the captain again. We learn that the woman has told the captain of a mechanic working in a nearby factory. We should go over there and persuade him to join our journey, as his skills are likely to be useful. Before departing, the captain says we should pick up something for our journey. 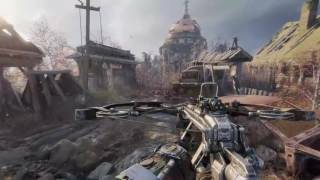 Artyom is handed the familiar pneumatic rifle, for which ammo is craftable and one that is reloaded by manually pumping air. Given that, like in the past games, ammo is very scarce, we were completely depleted from the church firefight, so this rifle came as a timely relief. We headed out to the other side of the tracks this time, again using a boat to cross a small stream, and then exploring a larger island. A pack of huge rat-like creatures were gathered around a container, and because of the limited ammo, we chose to sneak by them without engaging. We reached what looked like a small apartment building, where we got ambushed by a human zombie-like enemy that caught Artyom off-guard, and needed to be put down messily. We began to scavenge and explore the building, but sadly our time with the demo came to an end. Metro Exodus looks to build on the great atmosphere that the franchise has already established, all while continuing to innovate and improve. While it promises an open-world experience, our E3 demo was largely quite linear with just the occasional side path. It was certainly great to be outdoors though, and perhaps the full game will feature more open levels. The shooting and stealth mechanics were satisfying, and the new crafting and customization mechanics will help expand on the depth of the experience. Look for Metro Exodus to launch on Xbox One, PS4, and PC in February 2019.